Visix will exhibit in booth 452 at the 2019 Texas Computer Education Association (TCEA) Convention and Exposition, February 4-8 at the Henry B. González Convention Center in San Antonio. The company will showcase digital signage solutions focusing on student engagement for K-12 schools and school districts. Visix will feature their AxisTV Signage Suite software with easy widgets for building content, importing media, and scheduling messages and feeds. They will also display interactive and E Ink room signs at the event. Attendees are invited to come to booth 452 for a hands-on demonstration, and to learn how these products work together to give schools a centralized system to modernize, streamline and unify communications. AxisTV digital signage software is a scalable platform that lets schools schedule announcements, event schedules, daily menus, alert notifications anda host of other content types on screens of their choosing. Individual messages can be published to a single screen or across an entire school district. 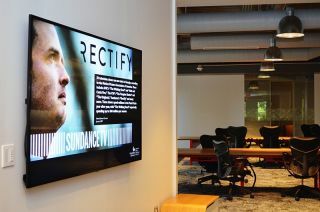 The company’s EPS e-paper rooms signs offer an affordable, wireless option to replace printed schedules for meeting rooms, classrooms, auditoriums and libraries. They are battery-operated and easy to mount, and can be branded with custom faceplates to match school colors or décor.